China reserved more than $3 trillion in foreign exchange assets last year, the world's largest reserves, despite currency depreciation affected by global market volatility and trade tensions. The Chinese authorities usually recognize $3 trillion as a psychological threshold for the reserves, just like the threshold of 7 yuan per dollar for the exchange rate. If figures go below those lines, investors may lose confidence in the renminbi's value. "It is a good result for last year's foreign exchange reserve management, as we see the investment return was increasing, especially in the latest months, with stable expectations for the renminbi," said Zhang Jun, a foreign exchange trader with China Merchants Bank. In December, the reserves rose for the second consecutive month to $3.07 trillion, up by $11 billion within a month, after a rise of $8.6 billion in November, according to data released on Monday by the State Administration of Foreign Exchange. 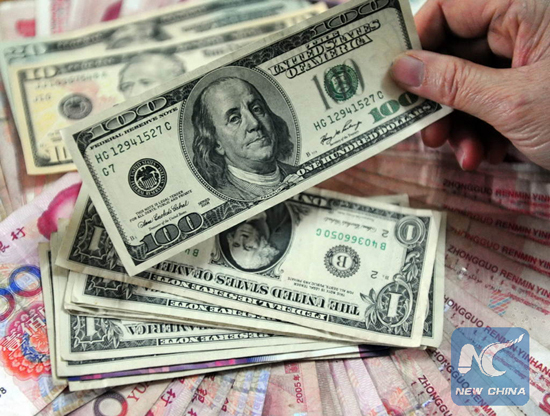 Appreciation of nondollar currencies against a weaker greenback and a price increase of major countries' bonds held by China were major factors that contributed to the reserves' growth, said Wang Chunying, the administration's spokeswoman. "A large part of the recent value boost came from investment returns, mostly in US Treasury bonds," said Ming Ming, an economist with CITIC Securities. "The Chinese currency's depreciation pressure has also been eased based on the more independent monetary policy," he said. China's total foreign reserves dropped slightly by $70 billion last year from $3.14 trillion at the end of 2017. During the past year, the onshore renminbi weakened by 5.3 percent against the US dollar due to extended fluctuations in the global exchange rate market. Analysts said that last year, Sino-US trade tensions and the US Fed's monetary tightening process increased the concerns of global investors. The foreign exchange reserves are usually seen as a buffer to trade off currency depreciation, with a correlation that the amount always drops when the authority takes measures to prevent renminbi depreciation. It declined to $2.998 trillion in January 2017, the lowest level in six years, and rebounded to $3 trillion a month later, according to the SAFE data. A research note from Goldman Sachs said that instead of using foreign exchange reserves to maintain a stable currency, the Chinese authority could manage the market's expectations on the renminbi's value using various tools. "The Chinese foreign exchange reserve is expected to remain generally stable in 2019, due to the sound economic growth momentum in the long run," said Wang, the SAFE spokeswoman. Liu Min, an analyst with global foreign exchange trade platform FXTM, said expectations of China's foreign exchange reserve remaining stable could provide certainty to the global financial market and help calm global investors' risk-aversion sentiment.